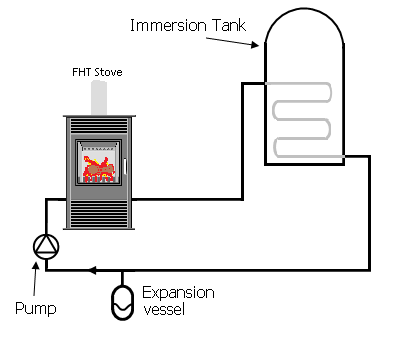 The FHT Stove can be connected in various ways, including directly into an existing heating system. The difference compared to a 'back boiler' system is that a pump is required. The circuit can direct heat to any location at any level, unlike most 'back boiler' systems which must circulate heat to radiators above the stove by natural convection for safe operation.